This of course is the issue of the ongoing mostly real world-ish Vietnam War comic that guest-starred Marvel super-heroes. Now, it’s not as egregious as it may sound…the premise is that a U.S. soldier in Vietnam imagines how conflict would go if Iron Man and pals were around, and, you know, a guy imagining what that would be like is at least within the realm of possibility. It’s not like, say, the Punisher showed up or anything. So the premise doesn’t really break the main conceit of the book, that it’s a dramatized “realistic” retelling of the war, from the points of view of the men on the ground. Of course, in execution, it likely plays out differently. In context of “this is all in a fella’s imagination” it may be, but it’s still pictures of superheroes fighting in the Vietnam War in a comic that had eschewed that sort of imagery. The suggestion that bothers me the most, however, is the idea that retailers should tell customers “hey, that Sgt. Fury comic with Captain America is worth a lot now, wink wink, nudge nudge,” implying that surely this comic will be a highly sought-after expensive collectible in short order as well! (Recent sales on eBay: one copy at 99 cents.) If you’re trying to convince customers to buy a comic for its possible investment opportunity…well, I never ever ever do that. Partially because I want people to read and enjoy their comics, but mostly because I don’t want someone to buy three dozen copies of something on my investibility precognitive knowhow, only to have said items turn out to be a bust and suddenly the buyer’s back in my shop with, like, one of these. Also, that Sgt. Fury comic is from the mid-1960s, and features an early Silver Age appearance of Captain America. Not quite the same as a boom-period comic with reworked Romita Sr. drawings, when it comes to demand. I do plan on going back to that post about the Boris the Bear variants/flyer, so keep your comments there comin’, if comments you do have! I feel like I need a shower after reading those suggestions. Re: The Nam’s sales and collectability, didn’t the series actually start off rather popular? I can remember the first issue being a on-the-wall-behind-the-cash-register-for-$10 book within months of its first publishing. That was a weird issue. 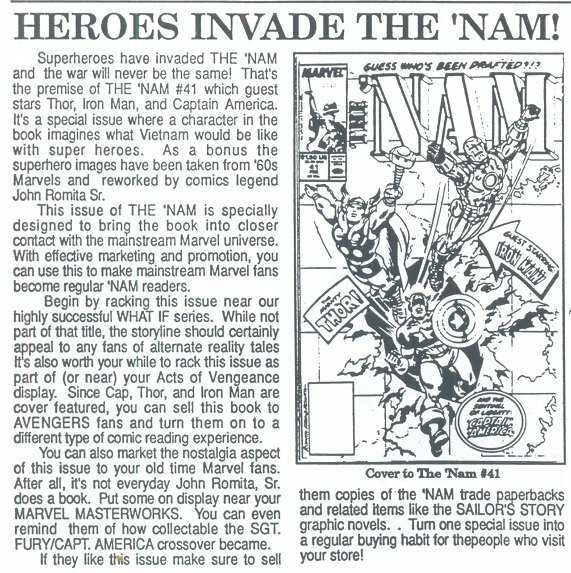 It did get me to buy an issue of The ‘Nam long after I’d dropped it, because I couldn’t imagine how they’d work the superheroes into it. Eh, mildly clever. Heh – Sgt. Fury #13 was the very first Silver Age comic I ever bought. My eleven-year-old self improvised a backing board for the Ancient Treasure from the lid of a donut box. The ragged top of the “board” still projects above the others in the longbox. The colors weren’t lined up correctly on many pages, which irritated the crap out of me back then. Now it’s kind of charming.